This maybe gross but it is true my mom no longer having any teeth, she is only using faux teeth to help her to chew the food. 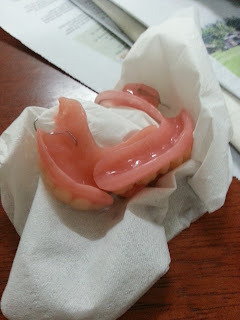 Recently I found out that there are more teeth for her as dentist need to extract all her tooth. The faux teeth are not useful anymore it keeps coming out of her mouth. She says that she eats half way the faux teeth comes out, first she would use the gum but glue to her them but it is not useful anymore. My son saw the faux teeth and in the night before he fall asleep he keeps asking me how to grow back the teeth. He asks is it can eat vegetables, meats to help the teeth grow back. Mommy is born in the year of Tiger, I would say my mom is also toothless Tiger now. I can never forget the day I saw her with bad teeth at the bottom of her mouth, I cannot believe that the bad teeth had spread so fast to other teeth making her teeth worsen. Mommy loves drinking 3 in 1 white coffee. My mom and grandmother in same situation both are toothless. My grandmother is blind living in old folks home in Cheras.